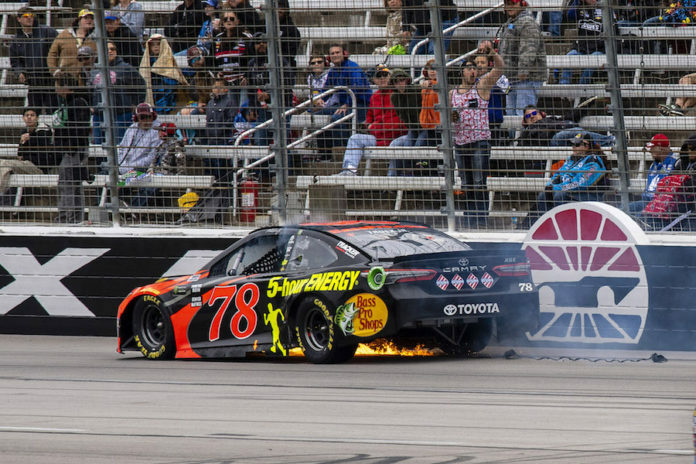 While running in second place with five laps remaining in Stage 1, Martin Truex Jr. saw his day cut short when his car exited Turn 4 and went directly into the wall due to a flat tire. The high-speed, Lap 80 impact caused race-ending damage to Truex’s No. 78 Bass Pro Shops/5-hour ENERGY Toyota in Sunday’s O’Reilly Auto Parts 500 at Texas Motor Speedway. The Furniture Row Racing driver was credited with a 37th-place finish. “That one hurt,” Truex said after his spotter Clayton Hughes asked if he was ok.
Truex, who was running fast lap times on the 1.5-mile oval, said there was no warning of any problems before slamming into the concrete barrier. “Well, just blew a right-front tire out of nowhere,” Truex said. “Not sure what happened there – if we ran over something or what. We hadn’t had any problems all weekend and the first set of tires looked good. Would have been nice to have at least finished that first stage before it happened, but that’s just the way it goes sometimes. The accident snapped a streak of five consecutive top-five finishes for Truex and 10 straight top fives on 1.5-mile tracks. Truex, who only got one point for finishing last in the 334-lap race, dropped three spots in the driver standings from second to fifth. The race winner was Kyle Busch. Rounding out the top-10 in order were: Kevin Harvick, Jamie McMurray, Erik Jones, Ryan Blaney, Joey Logano, Kurt Busch, Darrell Wallace Jr., Clint Bowyer and William Byron. There were eight cautions for 48 laps and 16 lead changes among eight drivers. The race was also red-flagged once for 11 minutes. The next race is Sunday April 15 at Bristol (Tenn.) Motor Speedway.